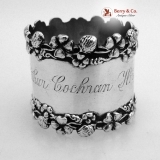 American sterling silver napkin ring with applied four leaf clover borders, c.1890. This beautiful napkin ring is 1 7/8" in diameter, 1 3/4" tall and weighs 42 grams or 1.4 ozs Troy. The excellent original condition and clear detail, inscribed Arthur Cochran Hirst, no repairs or alterations, make this an especially attractive offering.